an edited version of the post below appeared in the philippine star last sunday. you can read it here. sick of hearing about my pilipinas yet? don’t be because collezione C2’s creative director rhett eala–the guy who launched a million philippine-map shirts—has got something new up his polo-knit sleeve. today, he will be launching a collaboration between collezione C2 and moleskine, the popular luxury notebook. “the regional distributor, arnault castel, who is based in hong kong, heard about the success of our shirt,” says rhett. “and he became very interested in hooking up with the brand when efren peñaflorida became our brand ambassador because moleskine is into promoting and supporting literacy.” although moleskine has collaborated with other countries for special-edition notebooks, this is the first time they’ve done any project with the philippines. “it was a long process because arnault had to send the proposal to the head office in italy,” says rhett. “all my sketches and specs had to be approved, so there was a lot of back and forth via e-mail. 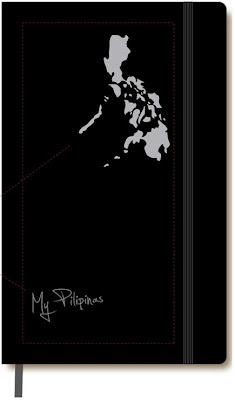 i even had to fly to hong kong for the presentation.” the limited-edition collezione C2 moleskine will be available in two sizes (desk size for P1,300 P1,480 and pocket size for P980 P995) and in two colorways (black with either a silver- or gold-stamped philippine map). it will be available in select collezione C2 branches and national book stores starting today, february 17. “we intend to release other limited-edition versions with other colors combinations, possibly a red, white, and blue one for independence day and a 2011 planner later this year,” says rhett. write on!